Recently I had heard via Facebook of a new climbing media project called The Circuit, a magazine dedicated to the World Cup and the climbers who compete in it. I was interested in this for several reasons, not least because it was actually being published in hard copy form at a time when climbing media (and sports media in general) has been focusing on its online aspects. Also, as Eddie Fowke points out below, English-language readers do not get much in terms of stories and interviews about this kind of climbing in general. Eddie Fowke, the publisher and editor of The Circuit, kindly sent me a copy for review and I have to say right away that this is one of the most interesting and entertaining magazines I have seen in a long time. Long interviews with leading competitors and other figures such as longtime routesetter Jacky Godoffe and coaching and climbing analysis wizard Udo Neumann provide the best insight into contemporary competition climbing you are likely to find between two covers. Some of the climbers interviewed include Shauna Coxsey, Mina Markowic, Alexander Megos, and Chris Webb-Parsons.The magazine is loaded with high-quality photographs from around the world printed on very high quality stock. This issue focuses on bouldering both inside and outside but future issues will have other themes. The first issue has virtually no advertising, though I would expect this to change going forward, meaning an uninterrupted reading and viewing experience more similar to a book. In fact it reminded me of two books from the 90s, Rock Stars by Heinz Zak and The Power of Climbing from David Jones, both of which opened a window onto the state of the art at the time. Also 8a.nu published a yearbook for a few years which I thought was worthwhile for the record it preserved for the world sport climbing and bouldering scene. If you want to get a better picture of how the competitors approach the challenge of climbing in World Cup comps or what the routesetters are trying to do, The Circuit is an invaluable documentary effort in that direction. 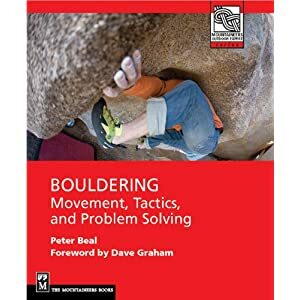 If the climbing world wants competition climbing to be taken seriously, as in being part of the Olympics, it will need publications like this to help make the case. I think this is a great project to support so to purchase a copy just go to http://www.thecircuitclimbing.com/Buy for more info. Make sure to check out the Facebook page and blog as well. In order to get a better idea of what Eddie is trying to achieve with this project, I did a short email interview with him. 1. When and how did you get the idea that international competition climbing needed a magazine like this? I’ve always loved climbing magazines and in the early 90’s it was the only way to follow the competition circuit. Sadly even with growing participation and following worldwide there never seemed to be much content in the existing English Language magazines. It’d always be a paragraph or two at best. If you look at any other sport or activities they have specialist publications that act as aspirational and educational platforms, climbing magazines (again I only speak of English language ones) had never had this niche filled. I felt it was time to fill that niche and get some psyche out there! 2. How did you actually get the process started and what did you need to learn along the way? I’ve been taking photos of some of the top climbers, boulderers especially, for several years now. After my friend James Kassay did some of the IFSC Bouldering World Cups in 2012 and it watched the streams of all of them I decided to attend some of the World Cups myself in 2013. For the World Cups I was shooting and writing competition reviews for the Australian digital magazine Vertical Life which gave me the opportunity to get really involved and the more people I shared my vision of a high performance climbing magazine with the more engagement and psyche I got back. It just gained momentum from there. I had to learn every aspect of assembling a magazine from scratch, I was a competent photographer so that I was comfortable with but I had to learn to interview and how to transcribe the interviews. Some interviews I left very natural as I felt by anglicizing the answers it would take out some of the subject’s personality and personal flavor. For instance Mina Markovic is one of the most passionate climbers I’ve ever met, to her English is not a first language but when I tried to paraphrase her answers I would lose some of her passion, her absolute love for the sport. It was very much the same for Jacky Godoffe who spoke with such flair and belief, an open integrity that it wouldn’t have done him justice to water that down. The hardest two aspects for me so far have been layout and logistics. I had only very limited experience with indesign from about 7 years ago so I had to learn that basically from scratch. I put so many hours into watching tutorials and reading about how to put together a magazine, then I just flogged myself, putting in hour after hour laying up pages… Discarding them… Repeating… It was hard, soul crushing work at times. Lastly the logistics of freight has been an intense learning curve. To make a self-published print magazine work I needed to keep the costs as low as possible and mailing to purchasers directly from Australia was going to be a nightmare so I ended up having to find a workable freight solution. Not easy! 3. How did you finance the project? I noticed that there is virtually no advertising. The single biggest expense for The Circuit has been the time I’ve put in. Compared to most startup businesses, the actual financial commitment has been kept in check by doing the vast bulk of the work myself. Sure traveling to the World Cups last year was expensive but I was going for me, it was also a holiday so I don’t really consider an expense. Now though, the simple truth is I need to sell plenty of copies to fund this year’s trip where I intend on getting the raw material for the next couple of issues. I ran issue 1 almost devoid of advertising for two reasons. Firstly I was just so busy that I didn’t get the time to write up proposals for prospective advertisers and secondly I didn’t want to undervalue the advertising space I had available by giving cheap adverts as The Circuit was an untested product. As an aspirational magazine I only want quality advertising and the companies I want to advertise need to be supporting the sport in a positive way. I know the current magazines operate on a very advertising dependent business model but I think a lot of magazines are just drenched in advertising so I’ve made a conscious decision to limit the advertising space available to let the content shine through. I only had a single advertising spot in Issue 1 and that was given as a free ad to CAC (Climbers against Cancer). I strongly believe in their cause having spent time with John Ellison in Europe last year and seeing my own father lose his battle with cancer while I was writing the magazine. I don’t have a lot to give back but if The Circuit can raise awareness and give a few thousand dollars to CAC to help in the fight against cancer then it’s a start. 4. Is the magazine going to be annual, bi-annual, or more frequent? Initially we will be an annual publication but long term the goal is to go bi-annual. With the content we have being based around the athletes and legends of the sport two issues a year should be easily manageable. I would rather have a content heavy, quality magazine that is collectable than dilute the content over a number of issues and chase the more news based market of existing magazines. Although magazines have a definite place reporting news, for the most part they can’t compete with the internet. Paul Robinson’s thoughts on reporting news such as a hard first ascent are in the closing interview of issue 1. I agree with what he’s saying and think magazines become the archives for the exceptional, not the 8c’s in a hole as he so succinctly describes them. 5. What kind of readership are you aiming at, what do you want the magazine to provide for its readers? The Circuit is a platform to capture the history of high performance professional climbers. Through interviews and feature articles I want to get into the heads of these amazing athletes, to learn their stories and share them with climbing lovers worldwide. I see The Circuit being aimed at two main groups in the climbing community. One group is the aspiring elite who want to augment their vision of the sport with the wisdom of their heroes. The juniors, the local elite who want motivation to put in that extra hour of training in their goal of one day being an elite climber. The other group is normal climbers, lovers of the sport like me who just want to know what makes this incredible sport tick. The people who get up all over the world and watch the IFSC World Cup streams at stupid times of the day just because they love the sport. 6. In an age where print publishing is apparently on the decline, why did you opt for a glossy high-quality print magazine? I believe that a printed magazine can have collectible value. A digital file doesn't have that. If a magazine like The Circuit can capture a time and place in the history of climbing it can be placed on a shelf and referenced later. With a digital file odds are it’ll end up on some hard drive that’ll eventually fail, some tablet that’ll get superseded. One of my main inspirations for The Circuit was Rock Stars by Heinz Zak. Even though it came out in 1997 it is still a fascinating view of climbing in the 90’s, the birth of professionalism. If through a periodical format The Circuit can achieve the same in the 21st century than it will be mission accomplished. To do that I believe print is the best medium. 7. What directions do you want to see the magazine take in the future? Building on the first issue I’d love future issues to be more collaborative efforts. I was lucky enough to have a great multilingual European correspondent in Nat Berry help me with issue 1 as well as the talented Dutch photographer Bram Berkien and Dave Mason from the UK supplementing my own photography. For the future I would like more interviewers and photographers on board to bring different perspectives and to let me have some degree of a normal life again! Ideally I’d like The Circuit to be available at the IFSC World Cups where fans could buy copies and get them autographed by the pro’s. Like how you’d buy a program at a major sporting event now. Lastly I want to theme the issues. Issue 1 had a working title of Origins and looked at where the included climbers came from. For the coming issues I want to look at climbers who are doing it all on their own for the love of it. The trail blazers of their countries on the international stage. That and the growth of the sport in the east. From the time of Yuji Hirayama coming to France to pursue his dreams through till today where the Asian climbers are among the best in the world. Thanks Eddie and good luck with this magazine! Great review thanks Peter, I've already ordered a copy waiting for it to arrive!